Today I’m thrilled to have Michael Stelzner on the show. Now I was introduced to Mike by my friend Darren Rowse of Problogger and I’m really glad that he made the intro. Mike runs the ridiculously popular site Social Media Examiner which gets an insane amount of traffic. I’m just going to make a rough estimate here but I’m guessing somewhere in the 1.1 million uniques per month range. He’s got over a half million email subscribers and a half million Facebook fans for his page. Mike also runs the largest social media conference in the world called Social Media Marketing World which is happening from March 22-24. How he built up each traffic source. Steve: You are listening to the My Wife Quit her Job Podcast, the place where I bring on successful bootstrapped business owners and delve deeply into what strategies are working and what strategies are not with their businesses. Today I have the legendary Michael Stelzner on the show, who runs Social Media Examiner perhaps the most popular social media site around, but before we begin I want to give a quick shout out to Klaviyo who is a sponsor of the show. Now I’m super excited to talk about Klaviyo because they are the email marketing platform that I personally use for my ecommerce store, and I depend on Klaviyo for over 20% of my revenues. Now you’re probably wondering why Klaviyo and not another email marketing provider. Well Klaviyo is the only email platform out there that is specifically built for ecommerce stores, and here’s why it is so powerful. Klaviyo can track every single customer who has shopped in your store and exactly what they bought which makes it extremely powerful. So let’s say I want to send an email out to everyone who purchased a red handkerchief in the last week, easy. Let’s say I want to set up a special autoresponder sequence to my customers depending on what they purchased, piece of cake, and there’s full revenue tracking on every single email. Klaviyo is the most powerful email platform that I have ever used and you can try them for free at mywifequitherjob.com/Klaviyo, and that’s spelled K-L-A-V-I-Y-O, once again that’s mywifequitherjob.com/Klaviyo for a free trial. I also want to give a shout out to Privy who is also a sponsor of the show. Now what’s also cool is that I use and rely on Privy for both my blog and my online store. Now what does Privy do? Privy is an email list growth platform, and they actually manage all of my email capture forms, in fact I use Privy hand in hand with Klaviyo. Privy. Privy is easily the most powerful platform that I’ve ever used, and you can trigger sign up forms based on any primer you desire. For example let’s say you offer free shipping for orders over $100, well you can tell Privy to flash a popup when the customer has $90 in their shopping cart to urge them to insert one more item. Here’s another cool use case, if someone has item A in their shopping cart, I can easily tell Privy to display a special coupon code for that item or to display a related item or offer. In terms of email capture, I’m showing different email lead magnets depending on what product a customer is browsing in our shop. So bottom line Privy allows me to turn visitors into email subscribers, which I then feed to Klaviyo to close the sale. So head on over to Privy.com/steve and try it for free, and that’s spelled P-R-I-V-Y.com/steve, and if you decide that you need the more advanced features, use coupon code MWQHJ for 15% off. So once again that’s privy.com/steve, now on to the show. Steve: Welcome to the My Wife Quit Her Job Podcast, today I’m thrilled to have Michael Stelzner on the show. Now I was actually introduced to Mike by my friend Darren Rowse of ProBlogger, and I’m really glad that he actually made the intro. Mike runs the ridiculously popular site Social Media Examiner which gets an insane amount of traffic. And I’m just going to make a rough estimate here, but I’m guessing somewhere in the one million uniques per month range. He’s got over half a million email subscribers and a half a million Facebook fans for his page. He also runs the largest social media conference in the world called Social Media Marketing World, which is actually happening on March 22nd to the 24th. Now having run an event myself, I know that the amount of work it takes is tremendous. Mike’s conference is actually 40 times larger than mine, so I can’t even imagine the organization that is required. Anyways I’m actually going to be a speaker there talking about Facebook ads for physical products next month, so if anyone out there listening wants to meet up in sunny San Diego, look me up. And with that welcome to the show Mike, how are you doing today man? Michael: I’m doing great, thank you so much for having me Steve. Steve: Yeah Mike you know we met relatively recently, but what is your background and what gave you the idea to create Social Media Examiner? Michael: Well it’s a great story. I’m a serial entrepreneur; I’m 21 years in this adventure. My background is that before Social Media Examiner I was a writer, I wrote a book called Writing White Papers, and I was hired by lots of well known corporations to help them write these things called white papers which are like informative and persuasive designed to help the marketing department generate leads, sell, and all that fun stuff. Right around 2009, late 2008, early 2009 a lot of people started talking about social and it was like the buzz. So for my business back then I had a newsletter with about 20,000 people on it all about white papers and white paper marketing. So I started interviewing all these people in my network that seemed to understand Twitter, and Facebook, and LinkedIn which were pretty much the players at the time, and I just started to notice that whenever anybody wrote anything about social it was like exploding on social. So I got this crazy idea to start a website more as a movement called Social Media Examiner and kind of I didn’t notice any [inaudible 00:05:50], I started searching for domain names and to my great shock Social Media Examiner was available. Back then nobody was using three words, everybody was using two words, so the first thing I did was I registered the trademark, because I thought San Francisco Examiner was going to come sue me, because I just assumed they had a lock on the word examiner, and everything exploded from that point forward. Steve: So these 20,000 people that you started with, that was just from your white paper business? Michael: Yeah that was my white paper business, and I kept that going for about two years while I run Social Media Examiner like as a side gig. Not very many of those people moved over to Social Media Examiner. I would say I pretty much started from scratch just like everybody else does, and I did obviously use – because writers aren’t always interested in social, at least they weren’t back then, go ahead. Steve: And you mentioned interviewing them, was that like in a podcast or was that like a text based interview? Michael: What I did with the white paper business I would interview and I would change – basically I would do interviews, then I would work into an article and then they would get emailed. So back in the white paper days I would send a monthly email newsletter that was very long and would have four or five articles. It started before blogs were popular, and then eventually I started a blog called Michael Stelzner is writing white papers, because I was coming out with that book. But yeah interviews were always at the core of what I did. When I started Social Media Examiner actually I went to two different trade shows and I hired a video guy to come with me, and I did on ten minute on camera interviews with all the social luminaries at the time, people like Scott Monty, he used to work for Ford and Chris Brogan, and a number of other people and I just asked the questions that I personally wanted answers to, and that became some of the content we published on Social Media Examiner. Steve: Interesting, so you what’s funny Mike, I’m looking at your blog right now, I don’t see any ads, I don’t really notice many affiliate links either. I listened to your podcast and you primarily promote your own event, and so what are the main revenue sources for Social Media Examiner? Michael: It’s a great question, we don’t take advertising, so the way I describe us is we are a product based media company. So we are a true media company in the sense that we have a very big blog, a very big podcast, a live show, video stuff that we do just like any other media company, but our exclusive sponsor is our products, Social Media Marketing World during half the year and Social Media Marketing Society during another portion of the year, and pretty much that’s how we make most of our money. We have an email newsletter that goes out three days a week to about 560,000 people, and in that newsletter there’s links to our articles and there are also links to offers for eBooks and stuff, and those are paid placements inside of that newsletter. But that’s a small part of our revenue, the bulk really is from our conference and from our society which has kind of gotten monthly ongoing professional development and training. Steve: So what is the rationale for not including like affiliate links for example? Michael: So I thought to myself – and by the way a lot of my friends are affiliate marketers. I don’t think that there is anything wrong with affiliate marketing except there are some challenges that come with it and you know this to be true. First of all those affiliates expect that you’re going to promote them, and you do get to this point where you have to decide, do I want to be reliant on selling other people’s products or do I want to actually make my own products. I realized that there was a lot more money and if I was willing to do the work in creating and selling my own products as you know over actually just being an affiliate for someone else’s products. In early days every one of my friends even to this day, they all have their launches, they all have their products, so about four or five years ago I made the decision, we’re not going to do any affiliates for anyone under any circumstances ever. We just made the decision that we’re not in the business of doing that, we instead are going to be more like consumer reports, we’re going to be agnostic, and I think by making that decision it’s helped us in a couple of ways. First of all because we’re a pretty big media entity, there is FCC compliance rules, and we don’t want to have to deal with some of these issues. We have lots of writers that write for us and if we took an equity stake or if we took an affiliate relationship with these products, then there’s all sorts of disclosures that have to happen in the content that we produce. And we just want to be in the business of producing really high quality original content that is unencumbered with affiliate relationships, and allows us to produce our opinion on anything we want without any compliance issues. For us the money on the affiliate stuff no matter how good it is isn’t enough because we’re making so much more from the products that we sell. Steve: I notice on your right hand side bar there’s links, those aren’t affiliate links or? Michael: They’re not, no. We have Social Media Examiner recommends and we have a couple of company logos on the right hand side of our website. These are people that are part of our partner program, and what that means is they are spending at least $30,000 a quarter in our email newsletter, and that’s one of the benefits they get for that kind of commitment is that we will place their logo, and we only have four slots in the partner program. We’ll place that logo on our website which allows them to get a lot of branding and traffic to their website, but there is no affiliate deal at all, that’s just kind of a special pack we put together to help us sell out of our email newsletter inventory. Steve: Okay, that’s actually pretty interesting. What is the going rate for advertising in an email? Michael: $6,000 per day per slot. Steve: So per email or? Michael: So we can earn up to $12,000 on every email we send and it’s we don’t do direct sends ever, so our email newsletter is like – and by the way it has to do with the size of the email too, so the price used to be a lot less, but it’s like in block number one in the email will be a 70 word blurb which includes a link to our article, then block number two and three are promotions for free offers like eBooks. You know these guys are using us for leads and stuff, and then the next block will be a promotion for whatever we’re selling like the conference Social Media Marketing World, then last block would be another one of our articles. So we always begin and end with our articles to get the readers to get all the way to the bottom of the newsletter. Steve: Is it based on open rate or is it based on list size? Michael: It’s based on clicks. Michael: Okay let me rephrase. The way we sell it is everybody wants the clicks because the clicks drive the traffic and then they generate the leads, but the list size is what they’re buying, so they are buying a fast a highly accelerated way to generate leads because when you email as big of an audience as we do three days a week, they could get 1000 leads in 48 hours. So they’re not going to get that anywhere else at that speed for that price, you know what I mean? Michael: So that the cost per acquisition depending on the offer can be very economical but they ah veto make the commitment to the slot. Steve: Here’s a question, when you have like 500K subs, can you still just blast out your entire list? Michael: Oh yeah we do it three days a week. Steve: Okay interesting, I was told by – I can’t remember, maybe it was Noah Kagan or Neville Hill like once you get like that many subs you really have to segment is what they told me, because like if you blast too much at once like certain inboxes will just block you with the sudden flood of email that’s coming, but you just blast? Michael: Well I can tell you that we test this, we use a service called Glock, which is a third party email deliverability testing service and we get into the inboxes of Gmail, Yahoo, all the big ones without a problem. Steve: Okay and then when you’re blasting out, it’s just the articles that you’ve had for the last couple of days along with these advertisements? Michael: Yeah it’s kind of part of what we train our audience that you’re going to get three days a week emails from us for our articles. The idea is don’t miss our future content because we are always publishing every day really high quality content. Steve: You guys publish how many articles per day? Michael: We used to publish two, now we’re down to one, so we publish six days a week, we take Sunday off, and that allows us to put two of those articles in every one of those three emails that goes out Monday, Wednesday, Friday. Steve: I just want to take a moment to thank ReferralCandy for being a sponsor of the show. Now for any ecommerce store word of mouth is huge and when a customer is super happy with their purchase they will tell all their friends. What if there was a way to amplify word of mouth about your company, what if there was a way to reward referrals for your business? This is where ReferralCandy shines, with just a couple of clicks of the mouse you could add a referral program to your ecommerce store and reward your customers for telling their friends about your shop. Let me ask you this recently or in the last couple of years, the way Google has worked was like it’s quality over quantity. Do you find that publishing that often is making a difference versus publishing like one huge mega article every week? Michael: We have a very diverse audience that’s interested in lots of different topics, and if we just published one article a week, then we would not be as successful as we are because if you think about what we sell which is training on a wide swatch of different social media marketing topics, we have to attract people that are interested in LinkedIn and Pinterest, and Instagram and Facebook and Twitter and Snapchat and Pinterest. So for us to keep up with all that change that is going on in the space, and along the lines there is also blogging and there is also live video, there’s just so many YouTube, so visual images, there is all these different things. So we have a diverse audience that we’re trying to attract to sell the products that we need to sell and if we only publish once a week, we just wouldn’t draw the audience that we have, and we wouldn’t be able to sell as much as we sell. Steve: So to put up that much content, does that imply that you have lots and lots of writers? Michael: We have 52 people on the company and 11 of them are full time, the rest are regular part time contractors, some of them are practicing full time, and we do have a decent swatch of writers. Like every Saturday Social Media Examiner policies are wrap up week in the news in the social media, every Friday is my podcast put in a really rich article, and then Monday through Thursday are what’s left for everything else. We do have some staff writers, then we have some contributing writers and all that basically – there is always seems to be new writers are popping in, but it’s a lot easier to do now because we are really only talking about four out of six, really more of like two to three out of the six are contributing writers, and all the rest is done internally by staff. Steve: Has your content gotten like changed over the years? Michael: Yes but not much because we were always strict from the beginning, we were always 1000 plus words, lots of visuals, lots of sub heads, lots of captions. We’ve always been – to use the words of Michael Hyatt, “The gold standard when it comes to blogging,” but over the years other bloggers like Buffer have gone for the really like 3000 to 5000 word articles. We’ve decided not to do that, we would rather have two or three articles on a topic than one gargantuan one. I believe that our content is rich enough and our audience loves it enough that if we went that big, I don’t think anybody would read it, I think because we know how much time people spend on our site. Michael: And we know how fast this space changes, and to produce something like that is a lot more work than just producing a really nice article that’s 1500 words. Steve: So in terms of your traffic sources, what are your top thee? Michael: Take a guess at what number one is. Michael: Yes and it’s a huge chunk. Number two is our newsletter, so the second biggest source of traffic is actually the people that are on our newsletter. We track that using UTM primers, so after Google is our newsletter subscribers that are reading our content, and then the third one is Facebook. Steve: Facebook, okay. Let’s switch gears a little bit and talk about like your early days when you had nothing like no one was reading it, how did you get traffic early on and how did you build up the name? Michael: In the beginning it was really – pre Social Media Examiner I had been building relationships with marketers for years because of what I did in my writing, my white paper business was called White Paper source. Some of those people, those marketers went into the social world and I asked many of them who had become friends with me, who should I get to know, and many of them suggested people like one of them was Mari Smith who is one of the leading experts in Facebook marketing. But back then she was new on the scene, and many others like Amy Porterfield, she had left Tony Robbins and she actually came to work part for me, but then she went on to become also another expert. So I believe in developing relationships with people because I know people are having flow, and everybody has their own little networks and everybody seems to take care of each other in the blogging world. Michael: So in the beginning there was a couple of high profile writers that wrote for us, Jason Falls who was a big guy back in the day as a social media dude, Chris Garrett who now works full time for Brian Clark. He coauthored ProBlogger with Darren Rowse, Denise Wakeman who was a big time blogger back in the day, myself, and Mari Smith. We each wrote one article, they each wrote one article a month until they bored of it or was no longer interested, and then I leveraged all that star power if you will to persuade others to want to write for us. I even had a big button on the navigation bar that said write for us, and all this in bulk commerce demand came in because in the beginning we sold nothing. There was no advertising for anything, not even our own products. We also released an industry report which now is entering into its eighth year and that thing got crazy exposure for me and for Social Media Examiner, and a lot of people back then — like I wrote the very first industry report for the Social Media World. I was one of the first people they would call even in the industry, so a lot of people began looking at my research, looking at the content that we were producing and they just wanted to be part of this movement that I was creating because it wasn’t obviously any commercial objective, I had no desire to be consultant, this is really just a movement I was building. Steve: That lead magnet is still your main lead magnet today for email? Michael: Yeah we get somewhere between 20,000 to 30,000 opt-ins a month on that. Steve: It’s crazy, what was the incentive for the big bloggers to blog on Social Media Examiner? Michael: They knew my reputation. I didn’t have the huge bloggers, like Brian Clark told me he might write for me but he never did because he never went down that road of social, but I think the incentive was they believed in me, they knew that in the white paper world I was king at that space. I was an undisputed guy, so they kind of figured well maybe there is a chance that this guy could at least be one of the jokers, but maybe he’ll go somewhere and I think it was my reputation and I think I’m generally a nice guy and they figured what have I got to lose, this guy seems to know what he is doing and I’d love to hitch on and just see where this goes. Steve: Interesting so they wrote for free essentially? Michael: Yeah even to this day, everyone that contributes writes for free unless they are on staff, because like it’s usually everybody wants, they all want exposure. This is the secret source of what we do at Social Media Examiner, and by the way speakers at our conference speak for free. We’ve never paid a speaker, and the reason they do it is because when you build something that everybody is talking about and everybody likes and they know that there is quality. Everybody wants to be part of something that’s exciting and that’s headed in a certain trajectory, and they are willing to do it for nothing in exchange for the hope that maybe they’ll pick up some clients, or maybe they’ll establish themselves as a thought leader and indeed that has happened, so many people have gotten book deals and so many people have gotten famous as a result of them writing for us. Michael: Let me tell you we added 20,000 email subscribers in 90 days, so it wasn’t hard in the beginning either, we were over 100,000 by our first year. Steve: That’s crazy and that just came from other people promoting you? Michael: That just came from the traffic coming to the site back in 2009 and people wanting to learn more about social, the demand was there, everybody wanted to know more about how to market with social. Remember we were coming out of a serious economic problem in 2006 and social was the solution for a lot of these people, they were like I can’t spend money, I’m going to do the social side. Back then it was a big deal, because it was driving enormous traffic for most businesses, so I was in the right place at the right time I think you could argue. Steve: Was it Google traffic then early on? Michael: It was – surprisingly Google was the smallest in the early days, it was Facebook and Twitter and LinkedIn, and really Twitter and Facebook was driving enormous traffic. Now it’s much bigger, it’s gotten bigger and bigger over the years, but in the beginning search was the minority, it was 40%, 60% was social. Now it’s the other way round. Steve: And it’s just people sharing your posts? Michael: People would share our posts; it would go crazy viral, we would trend on Digg and all these other sites that nobody even thinks about anymore. Our staff would go crazy viral, on Delicious, I don’t know if you remember them? Steve: Of course I do yeah. Steve: Give me an example of an article that went crazy. Michael: So there wasn’t just any one thing. Part of this because I’ve got a writing background, I taught a lot of these people how to write like Leo the cofounder of Buffer wrote for Social Media Examiner back when he started Buffer and this helped Buffer get on the map, and now Buffer has got a great blog and much of what Leo learnt writing for Social Media Examiner, they apply over their Buffer. So I just had this insatiable demand for expertise, I mean for quality and in the very beginning we had like four editors working on every article, and they were all volunteers. So I think our quality was just really above what everyone else was doing, and as a result everybody was sharing that because they knew that if you want to learn about the stuff, then this is the place to go. Steve: Did you write any of your own posts? Michael: Oh yeah, I was writing one a week for the first probably a year or two because we needed enough content to draw the traffic in, but eventually I stopped doing that probably about two and a half years in because the amount of people that wanted to write for us exceeded the available spots that we had, so I didn’t need to do that and I didn’t need to write any more. Steve: So back in the early days did you make a conscious effort to scale and did it just kind of happen? Steve: So what did you do to scale, did it mean like more content? Michael: Yes it did, in the beginning there was like two or three articles a week, so I was writing one. Well actually in the very beginning there was two articles a week, so I would have high profile people write once a month because that was kind of within reason. I would write once a week and then eventually after a couple of months we scaled that up to three times a week and the goal was to eventually get to like four times a week. But then we realized, wow every time we add another article we get more traffic, so we scaled to five, and then we scaled to six, then we scaled to seven, then we scaled to eight and then we scaled to nine and we stopped at nine, we never got past nine, and then we eventually scaled back to six because over time we began to realize that were pushing the envelope of our editorial team’s ability to process these articles. Because we had nine a week, that’s a lot, so we would sometimes publish stuff that wasn’t up to snuff because you want to fill a spot, and then eventually we just decided you know what – I just said to my team I’d rather publish nothing than publish crap, you know what I mean? Michael: That was a huge relieve to them because they were struggling to keep the editorial calendar filled, but we never missed ever in the history of the company our publication goes, we’ve always been able to deliver. Steve: If you were to start all over today would you still try to pump out as many quality articles as possible? Michael: I’ve always measured everything, I’ve always been a Google analytics freak, so if I was starting again today I would want to see whether or not there is a correlation, whether or not the traffic is coming, whether the conversions are coming, that’s the key thing that we started many years in we started saying, okay wait a minute we’re not tracking email conversions. One example of something was Instagram apps, we trended number one on Google for two and a half years on Instagram apps and they were bringing like a 100,000 page views at least a month for like two years, supporting millions of page views. The problem was it wasn’t converting at all. I’ll take a million plus pages a year if I get a certain number of conversions on it but I wasn’t. Stuff that was getting a lot less traffic was getting much higher quantities of conversion, so we began saying to ourselves, we don’t want to just develop content for the sake of traffic, we want to develop content that is going to draw somebody that wants to stick around and receive this content on a consistent basis. Steve: I just want to let you know that tickets for the 2017 Sellers Summit are now on sale at sellerssummit.com. Now what is the Sellers Summit? It is the conference that I hold every year that specifically targets ecommerce entrepreneurs selling physical products online. And unlike other events that focus on inspirational stories and high level BS, mine is a curriculum based conference, where you will leave with practical and actionable strategies specifically for an ecommerce business. This event caters to sellers of all levels, and if you’re a beginner, you’ll leave the Sellers Summit with a product to sell, potential vendors and a road map for your business. If you’re an existing shop owner, you’ll learn proven techniques to take your business to the next level whether it be through learning advanced Amazon selling tactics, SEO, social media, pay per click advertising, copy writing, email marketing, you name it. And if you are an ecommerce entrepreneur making more than $250,000 per year, we’re also offering an exclusive mastermind experience with other top sellers. By conversions do you mean email sign ups? Steve: Okay so lets’ talk about list building for a sec, what are some ways that you boost email sign ups, is it all organic based on the articles? Michael: We do a bazillion things over Social Media Examiner. We use OptinMonster as our primary way to capture leads, and we’re pretty aggressive about it, so we have a pop up that comes the very first time someone comes to the site within the first like ten seconds. And then we also have one on the side of every article, and then as you scroll down the article and you get near the bottom we have a scroll in thing that I’ll ask them if they want to get a report, and in the very bottom of the article we also have another one. Then on the home page we’ve got one and as people leave the site we have a pop up. So we’ve got like if you come in at any particular article you’re going to see at least four or five options, some pretty in your face to get you on our email list. Steve: Is the lead magnet the same no matter where you are? Michael: It is but the way that we display it is different in every single case, so at the point of entrance and the point of exit, they look totally different. So it doesn’t look like it’s the same offer, and we put down a lot of – we do almost weekly split testing to try to tweak as much as we can to try to grow that. Steve: You mentioned that you’re selling ads for your email and I’m just curious like how that’s different than actually selling ads on your site in your mind? Michael: It’s a lot more money first of all. People are willing to pay a lot of money to have email inbox deliverability of their ads. Display advertising is kind of a dying thing, I mean anybody who takes display ads realizes that they’re making less money now than they did a year ago and they’re making even less than they did two years ago, and it’s partly because of programmatic advertising which is pretty much algorithms deciding the best cheapest way to deliver these ads, so the cost per 1000 is so low right now that there is not a lot of money. What people are doing is either putting more ads on their website to try to make more money and what does that do, that just sends people away from your site. So the ads inside the email newsletter are only ads that we approve and they are almost always free offers for eBooks and content, so they kind of don’t look like ads because we’re not selling like a product specifically, they are actually offer like here is a free report on this or that and they are lead generation. So they are quite different, they are text based, there is no graphics, and it kind of looks like an article but it does have the word ad or sponsor next to it, so we disclose that it’s not — so have disclosure on what it is. Steve: And when you’re sending your emails, it’s primarily just your articles, you’re always sending out content for the most part? Michael: Three days a week only content. When we have something to promote or send a dedicated blast like if we have a sale on Social Media Marketing World like last week we had a big sale, we do dedicated blasts on those cases. Steve: That’s crazy okay, so I’m just curious when you send out email that often what do your open rates look like if you don’t mind sharing? Michael: I can’t disclose to you the actual numbers on air, but I can tell you they’re pretty significant. The open rates for our newsletter and for our dedicated blasts are identical and they are high for a list of our size. But the good news is that we’ve had to work really hard to make sure that we can get that delivery in to the in box and our audience does not unsubscribe when we send promotional emails, or they rarely unsubscribe, they stick with us. I think part of it comes down to the fact that we have consistently been providing value to their lives for a while. They are high for a list of our size. Steve: Okay and what are some things that you’re doing to maintain high deliverability rates? Michael: We don’t send any graphics in our newsletters, pure text and we get to the content almost immediately, we don’t have any kind of fluffy introductions or anything like that. In the subject line of the newsletter we always make sure that the subject line is something that we know our audience would be interested in. So for example if we’re sending out an email on Wednesday and we’re going to reference on Monday and Tuesday article, we’ll selectively choose which of those two articles is going to get the higher open rate as the subject line, and we make sure that we spread out our editorial so that we have three good subject lines in our newsletter no matter what because we – and we have research from our – we just surveyed 5700 of our email subscribers to understand what they are most interested in learning about, so we take that research and those headlines and couple it together. Steve: Is that at the end of the email? Michael: Yeah, it’s a little bit of a kind of hey you’ve been with us for this long, kind of makes them think twice before they unsubscribe. In our promotional stuff we give them the option to opt out from receiving promotions instead of just unsubscribing from the whole list. Michael: They can do either one but we always provide that as an option for people, and we also give people an option to transition over to a weekly broadcast instead of three days a week broadcast. Steve: I see, okay I was just going to ask you that, like how do you prepare people to get blasts three times a week? Michael: The moment they sign up, we tell them right in the beginning here is what you’re going to expect. We say thank you so much for – the subject is your free gift or something like that and they get the eBook and in the newsletter it says, “Thank you so much for signing up for Social Media Examiner’s newsletter, here is what you can expect. We are going to email you original content three days a week and blah, blah, blah,” so we set that expectation from day one. Steve: And in terms of the subject lines for your email blasts, do you use like content based subject lines or do you use like catchy ones just to get them to click? Michael: No we use the actual headlines from the articles, so it might be like in brackets SM Examiner so they know it’s from us, and then it might be like just a headline like I’ll give you a quick example. It might be like three ways to improve your Facebook ads, which happens to be one of our articles from yesterday, so most people are going to be like oh I want to learn that. Steve: They all sound actionable, so I can see why people will want to click on those. Michael: Yeah all of our content is highly tactical, so we don’t publish any opinion stuff at all. Steve: So you got the content, you got this huge audience; you got this huge email list. My question to you now is why conferences, they are not really easily scalable, requires a lot of physical resources, like what’s your rationale for focusing on this large event? Michael: Well I guess the question is why should someone go to a conference, and I will tell you I started Social Media Examiner by going to a couple of conferences one of which doesn’t exist anymore which is Blog World. For me it was important because I knew everybody in the space was going to be there, and I needed to network with those people if I was going to be able to grow my business. I remember meeting like Leo from Buffer there and so many people that are now close friends, and well social media is absolutely true that you can develop relationships quite quickly with Twitter and Facebook and stuff. You know this because you go to events and you have your own event, there is nothing like making that face to face human connection. It can accelerate relationships; it can lead to business development. That’s the reason that I go, but the reason people come to my event because they tell us this is because they want to accelerate their learning, and I would imagine that’s the same reason they go to your event. Michael: They want that professional development, they know that we have hand curiod these speakers and that we only like really high quality people like yourself to present. They think to themselves, all right are there enough topics that I want to learn about, would investing in coming to this conference and the air fare and the hotel and all that stuff, would it allow me to for example dig in to live video and walk away with a total plan on how I could crash live video, because that’s the hot thing right now? Or would it allow me to really go into Instagram because I’m good on Facebook but I’m not so good on Instagram. I think that’s the reason why 3000 to 4000 people are coming to San Diego to our conference. I found that they come for the content; they come back for the networking and the relationships because they form masterminds, they find customers, or they just find peers that can help them understand, comrades to join in the joint struggle, because this is a struggle. Steve: Yeah I know. But for you personally though like there is easier ways to make money that are less labor intensive? Michael: True but I will tell you when we started Social Media Examiner it was all online conferences, so we were one of the very first to do — significant online conferences started in 2008 which was really just many webinars spread over time, multiple times a day, kind of like the conference experience, but it was online. That was something that we’ve been able to do successfully for many, many years and I just always knew that I wanted to do something in person because I got my start at a conference, and I knew that there was just that magic sauce that happens at a conference. The reason I decided to start it is I was at my good friend Joe Pulizzi’s conference called Content Marketing World, and I just saw how calm he was, and I’m like, why are you so calm, he’s all, because they are event planners that do all the operational nightmare stuff that exist. I’m all are you kidding me? Oh yeah they exist. I’m like oh my gosh I want to do this. So I just kind of – I saw how calm he was and how cool his conference was because I’ve been to everyone since the first one, and I just said to myself, this is a business that I could execute on and do with excellence because I am all about excellence. And I just know it’s not easy to do and I know that if I could do with excellence, I wouldn’t really have a lot of competition, and frankly I have no competition, because there is no social media marketing conference that comes anywhere close to my event other than South Bay [ph] but no one would say that’s a social media marketing conference. Michael: That’s really a music festival that happens to have some interactive stuff in it. Steve: Actually incidentally that’s why I partnered with my friend Toni in my event, she handles all the logistics, I handle ticket sales and it’s like a great partnership. Michael: Yeah and it’s like I’ve got a big team now, a big part of my team is on that event side of thing and it’s a significant amount of money, but I will tell you it’s also a significant amount of risk. Like we already have as of this recording like 2500 people coming, and we just broke even like about a week ago. Michael: It’s a multibillion dollar expense and there is a lot of risk, and that’s why a lot of these guys go out of business. We have something a lot of other people don’t have which is a huge audience and really deep relationships with a lot of these people that kind of reduces a lot of the risks that people would normally have to do a conference of this magnitude. Steve: That is what I was just about to ask you actually, like how do you know how many people are going to attend year after year, so that when you put that money down you are not like having a heart attack? Michael: Well it’s a math science kind of stuff; I’m a daily geek. So we track a lot of stuff, the big expense as you know is food. The good news is that’s a variable expense so if you have less people you have less food expense, but the biggest expense really is labor and all the people expenses and stuff. So just like anything you have to make projections and budgets and commitments with hotels and stuff like that, and there is always risk that you won’t fulfill your hotel commitments and you have to pay the hotels, but we’ve never had that happen. So for us it’s just like we’re constantly monitoring it every day and every week and every month just making sure we’re where we need to go and we have like high and low thresholds, and if it looks like we’re not selling this many then we go back and we say we’re going to have to cut some of these things we were thinking of doing. So it’s like a crazy – it’s like one of those puzzles where you have to move all the pieces in one little square and you have to make a puzzle, those ones are the opinion of others who want it to flop. Michael: It’s like that and it’s not easy and that’s part of the reason why there is very few people that do bigger conferences because it’s unbelievably complex and it’s not for the faint hearted. Steve: What is your strategy for selling tickets, is it just email primarily? Michael: Oh my gosh no, we have like a 70 page marketing plan. Michael: We do everything, like right now if you go to our Facebook page we do behind the scenes documentaries and we do me appearing on podcasts which is the obvious thing. We have ads all over our website; we have every medium that we own, the podcast, the live show, the blog posts are all sponsored by Social Media Marketing World. We have speakers and affiliates and we have paid search, paid Facebook, paid everything, it’s impossible to not hear about Social Media Marketing World if you are in any way, shape or form a fan or a subscriber. Steve: It’s been following me around the web for like the past month. Michael: Yeah we do all that kind of stuff too, we do really sophisticated remarketing campaigns, yeah it’s no one thing. But I will tell you the stuff that delivers the most sales is obviously the website, because we have ads all over the place, so in aggregate that’s the biggest thing and then of course the emails are another really big thing. Then there’s hundreds of little things that all kind of add up, and when they all add up, they all kind of informs the final product. When you get to be like this is going to be our fifth year, when you gather reputation and when you trend globally like we always trend globally number one on Twitter when our conference is going on. We had 70,000 tweets at our last conference, so what ends up happening is people that are friends with the attendees can’t help but not see the bullets created, what happens when people come to the conference, because they take thousands of pictures, they go live, they talk about it for weeks and months afterwards. So we get an enormous amount of free plus from our attendees and they evangelize for us, and that’s really kind of cool because we’re getting at the point where a lot of our sales are unattributed which means it’s good old fashioned word of mouth. Steve: What’s nice also is that almost all your speakers have their own following too, right? Michael: Yeah they are all – not all of them but many of them are very high profile, for example I’ll throw out a couple of names, Guy Kawasaki, Mari Smith, Jay Baer, Ann Handley, Michael Hyatt, Chris Brogan, Mark Schaefer, Tim Schmoyer, Darren Rowse, Chalene Johnson, Shaun McBride, Joel Comm, Zach King, Marcus Sheridan, Pat Flynn. A lot of these people are like literally the dudes or dudettes in their space, like the top of the top, Cliff Ravenscraft, so because I just developed relationships with these guys over years and they are all like the kings and the queens of their space. As a result whether they promote for us or not they are known entities, which helps sell tickets because a lot of people are like I want to meet that person. Steve: Yeah that’s amazing, so if I can just summarize your strategy it’s just being a cool guy, establishing relationships, and just helping each other, right? Michael: Yeah and I’ll tell you one more thing, another way we make money on the conference that a lot of people don’t realize is we also sell virtual tickets for people that can’t travel, and it’s because – remember I mentioned how we started with online events, so we already had all the knowhow and systems in place to know how to capture all the recordings of all the sessions. So we sell those recordings and we have thousands of people that purchase virtual tickets, and that really is getting the access to almost 140 keynotes and breakout sessions and panels and workshops after the whole thing is over with. So there is a whole another revenue stream that we have that’s coming in on the virtual ticket front. Steve: So the listeners out there, the back story between this conversation is Mike has been trying to convince me to sell virtual tickets before the tickets are sold out, and so I’m going to just blindly take his advice and give it a try very soon. Michael: It’s really, really great because in our case it’s significantly less costly for the virtual ticket than it is for physical ticket, and on top of that when you don’t have – because like here’s the deal, a lot of people would love to come but they just can’t afford to travel, and they can’t afford to buy a ticket, but they might be willing to pay just to get to the content, and that’s always been the core. And we’re also getting in — you’ll be excited to hear merchandising too, so we had t-shirts. So last year we started selling t-shirts, this year we’re going to probably introduce a new t-shirt every year, so we’ll have two different t-shirt designs that we sell on site and eventually I’d love to get in the baseball caps and all that kind of stuff. So that’s not going to be a huge chunk of revenue, but merchandising is part of our future too. Steve: That’s cool, that’s good to know. Hey Mike we’ve been chatting for quite a while, I want to be respectful of your time, where can people find more about Social Media Marketing World? Michael: You can visit Socialmediaworld17.com, or you can just Google it or you can go to Social Media Examiner and check it out. Steve: And where can people find you online? 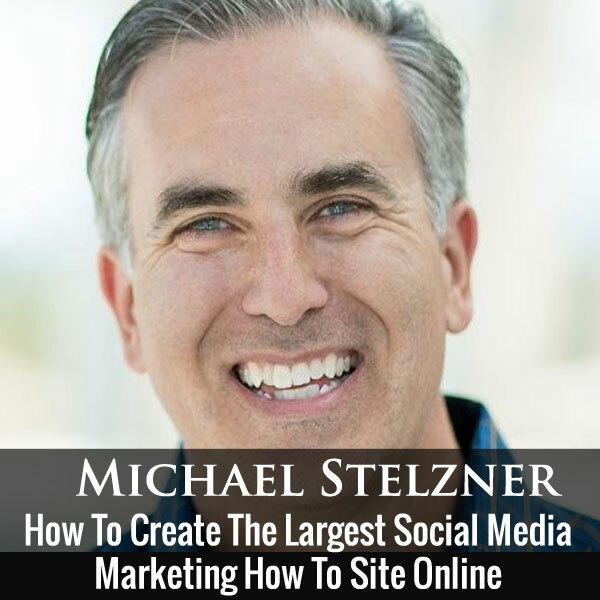 Michael: If you have room in your podcast listening, my podcast is called Social Media Marketing and there I produce really rich content every single week, and then on Twitter I’m Mike_Stelzner, or you can just Google my name and I’m pretty much everywhere. Steve: Cool, well Mike thanks a lot for coming on the show; I really appreciate your coming. Michael: All my pleasure Steve. Hope you enjoyed that episode. Now I’m actually going to be speaking at Mike’s conference Social Media Marketing World next month, so if you want to meet up, join me in sunny San Diego. For more information about this episode, go to mywifequitherjob.com/episode151. And once again I want to thank privy.com for sponsoring this episode. Now Privy is the email capture provider that I personally use to turn visitors into email subscribers, therefore email capture, exit intent, and site targeting tools to make it supper simple as well. I like Privy because it is so powerful and you can basically trigger custom pop ups for any primer that is closely tied to your ecommerce store. So if you want to give it a try it’s free, so head on over to privy.com/mywifequitherjob, and that’s spelled P-R-I-V-Y.com/mywifequitherjob. I also want to thank Klaviyo which is my email marketing platform of choice for ecommerce merchants. You can easily put together automated flows like an abandoned cart sequence, a post purchase flow, a win back campaign, basically all these sequences that will make you money on auto pilot. So head on over to mywifequitherjob.com/Klaviyo, and that’s spelled K-L-A-V-I-Y-O. Now I talk about how I use all these tools on my blog, and if you’re interested in starting your own ecommerce store, head on over to mywifequitherjob.com and sign up for my free six day mini course. Just type in your email and I’ll send you the course right away via email, thanks for listening. Thanks for having me on the show Steve! Always great to hear what’s new with Mike and his event / media company. Big fan of what he’s built. See you in SD next week, Steve!